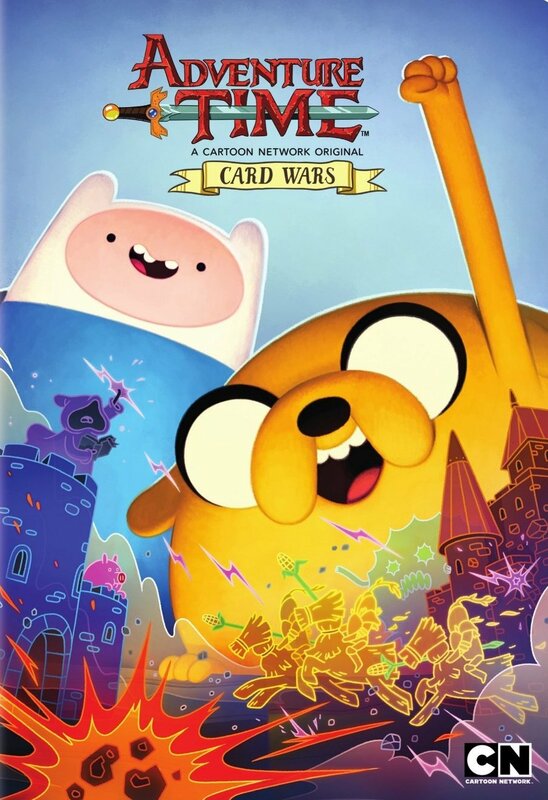 Another compilation of Adventure Time episodes has arrived on DVD, this time titled Adventure Time: Card Wars . As with the other Adventure Time compilations, the title of the release comes from the title of one of the episodes that is in the compilation. One other episode, Daddy-Daughter Card Wars , is related but the other 14 episodes have nothing to do with card wars. And that's fine; I'm sure if they had other Card Wars episodes they would have included them, but the ones they did include are still good. Most of the episodes come from seasons 6 and 7, but there is also one from season 3 and one from season 5. Card Wars, the primary episode in this compilation, focuses on a complex card game in the vein of Magic: The Gathering where you have lands and creatures and magic spells and your goal is to completely destroy your opponent. It's Finn the Human's first time playing against veteran Jake the Dog, yet despite Finn nodding off while Jake explains all rules Finn takes to the game like a fish to water and soon has the upper hand, which is hilarious to watch. This brings out the worst in Jake, causing Finn to have to make a decision regarding the outcome. This was a great episode which apparently launched a real Adventure Time card game called Card Wars, though I can't say I've ever played it. This episode is both humorous and shows well the friendship between our two main characters. I think most of us can probably relate to what happens here. The second Card Wars episode come from season 7 and is called Daddy-Daughter Card Wars. Jake the Dog enters a Card Wars tournament with his daughter, Charlie. Though she isn't really interested in it, she agrees to enter to play one game with her dad in exchange for one of his bones (don't ask, because I don't know). After the one game, Jake uses his shape-changing abilities to create a faux-Charlie so he can continue in the tournament, but struggles on his own. He realizes this game is still bringing out the worst of him, just like it did when he was younger. He was attempting to bury that part of himself for good with this tournament, and so both characters wind up having a decision to make... should Jake continue on in the tournament and should Charlie go back and help her dad. This is also a very well done episode, containing both humor and real emotions. Another episode I really liked is Everything's Jake from season 6. In this one, Jake nods off and sinks into himself, dreaming about an entirely new world that is made entirely out of him. Billy West from Futurama fame (among other shows) guest stars in this episode and uses three of his Futurama character voices to voice characters in this episode. He uses Fry's voice for Goose, Zapp Brannigan's voice for the mayor, and Professor Fanrsworth's voice for Dr. Adamkimson. It's so weird hearing those voices come out of other characters! It's also a fun episode with everyone thinking the world is in danger because Jake's growling stomach is causing tremors. The scientists want to allow Jake to leave this world so that he can grab something to eat while Dr. Adamkimson wants to prevent just that fearing that if Jake left then everyone would disappear and never come back. The disc contains 16 episodes in total, but I won't go through them all. You can rest assured that they are all good episodes. Unfortunately, this disc contains no extra features. It does, however, contain a Card Wars card inside the DVD case. I see others have mentioned that their DVD case did not contain a card. Thankfully, mine did. The card came enclosed in a transparent releasable plastic card holder to keep it safe. I couldn't tell you anything about the rarity of the card or how much help it could be in your battle, but it is an exclusive card so that has to count for something. My DVD did come loose, though, and was floating around inside the case. The center hook thing didn't break so I don't know why it came loose, but it's not the first disc that's done so. They would really redesign those holders. For $10, I'd say this is worth picking up.